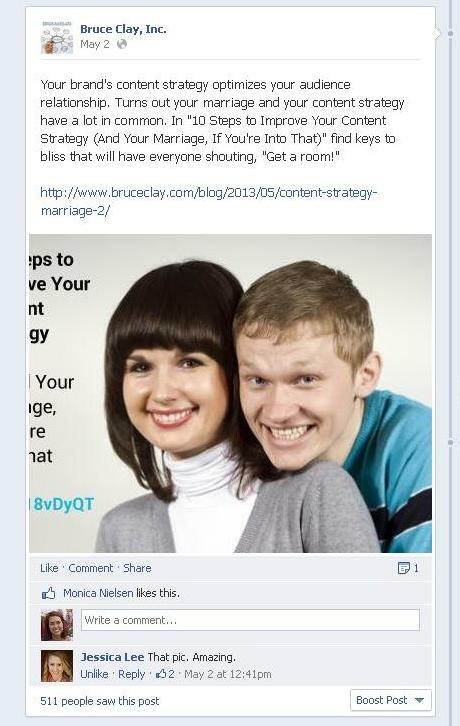 How to Make a Graphic-Text Mash-up to Promote Blog Content on Facebook was originally published on BruceClay.com, home of expert search engine optimization tips. I’m in a few Google+ groups focused on SEO, social media and content marketing. The question of what stock photo service to use and where to get free images has come up a couple times. It got me thinking about the process I use to find, modify and use images in my day-to-day. The stock photo site I use is Dreamstime.com because the price is right and the selection passes muster. If you use advanced search to set the price slider bar to the lowest setting, you’ll find images available for 1 credit in the extra small size. Extra small is usually around 480 px by 320 px, which is fine for both my purposes (blog posts and social media posts). Credits will run you $ 1.36 if you buy the smallest credit package to about $ 1 if you buy 120 credits at a time; 250+ credit packages save you even more cents. I checked out some stock photo site comparisons to get an idea of what else is out there and how they stack up. In 6 Stock Photography Services Compared I learned that Stock.xchng is the most popular free stock photo library, yet it has a limited selection. Among the most popular paid services, iStockphoto has the most massive library and Getty Images has a complicated pricing and licensing scheme. As long as you’re not looking for high-res or print quality images, you’ve got good free options online. When using images with Creative Commons licenses, the attribution requirement adds a hurdle to the graphic mash-up use for images I describe later since it adds another element to what must be included in the graphic. But, CC images are great for blog posts. 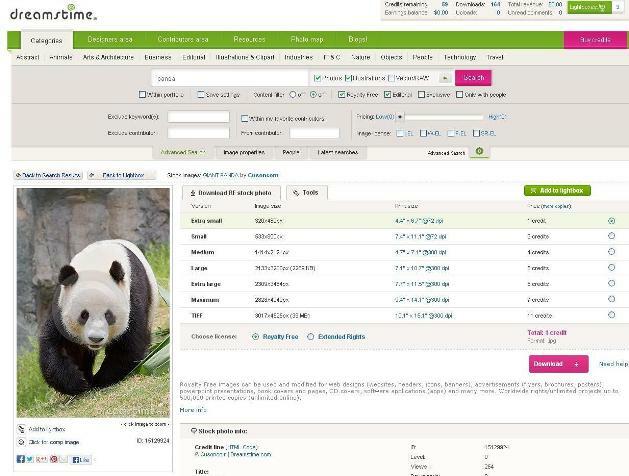 This panda image has a Creative Commons license that requires attribution. 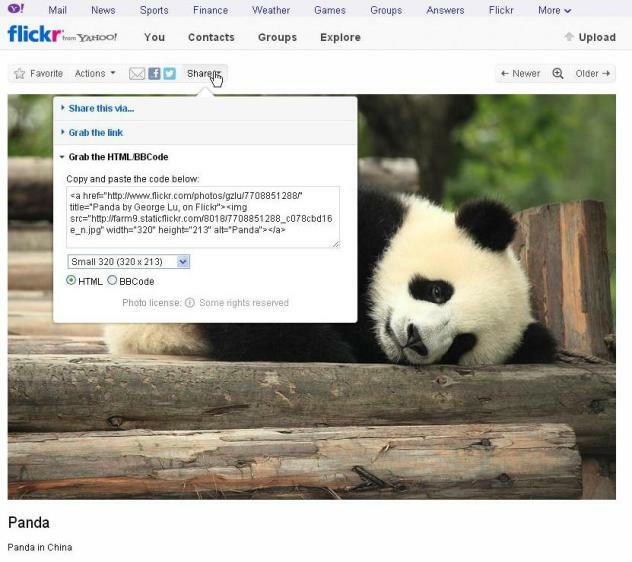 Flickr makes it easy to post the image to your blog by copying code that includes the required attribution. For a long time, I used Creative Commons licensed photos on Flickr that allow commercial use and derivatives. For use in blog posts, Flickr makes it easy to use Creative Commons licensed images, and the “share” function gives you HTML code including the required attribution. The Creative Commons site search includes Flickr, Google Images, Open Clip Art Library and Pixabay for images, and a number of media and music sources as well. This image was found in The Commons using Flickr search. It was taken in 1927 and is part of the State Library of New South Wales collection. You can also search Wikimedia‘s library of free images, a collection with Creative Commons copyrights, free documentation licenses or no copyright. For free images you can also search EveryStockPhoto.com, a search engine for free photos across a number of sources and including a variety of license types. You can also search Flickr’s collection The Commons, images that have passed into the public domain and belong to everyone, mostly due to their being old. You’ll find awesome vintage photos, advertising, illustrations and art that have passed into public use and can give modern blog and social posts refreshing classic flare. Since they don’t have copyright or licensing requirements, you can use public domain images for the graphic mash-up use which we get into next! This is my little trick for sharing blog posts on Twitter, Facebook and Google+ to get a little more attention than straight text updates. As you may have noticed, recent layout updates to Facebook and Google+ have put an emphasis on visual media. Skyrocketing mobile use of Facebook, along with other social media apps, was a big reason behind Facebook’s update last March. Images show up larger in the News Feed and may also get priority in the ranking algo. An update to Google+ around the same time also made images feature more heavily. And in the endlessly updating churn of a Twitter stream, a picture attachment makes tweets stand out and, as pictures are worth a thousand words, lets you extend your message past 140 characters. You can opt to include a logo for branding purposes as well. 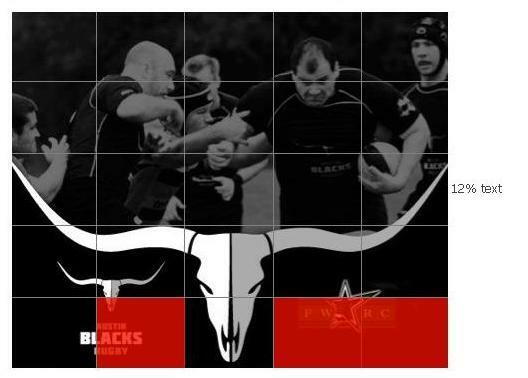 Note that if there’s text in the logo, it would add to your text to image ratio which Facebook limits to 20% for ads and promoted content. More on that below. I use the drawing function in Google Drive to add text on top of images. It’s super easy and Google gives you a ton of font options as well as shapes, arrows and call-outs you can add to the drawing. Here you can see a graphic mash-up I created last week to promote our Thank You page series. I shared this image on the BCI Facebook and Twitter accounts to promote a 2-part series on Thank You pages optimization on the blog. Sign in to Google Drive at https://drive.google.com/ and create a Drawing. Insert an image that you own or one sanctioned for public use. Create a custom short link to the content. If you’ve got a registered Bitly account you can customize links, and in the Elvis example here you can see I created a custom link “typagecro,” which I chose to suggest “Thank You page CRO” (conversion rate optimization). Another bonus of a registered Bitly account is that you can track clicks on your short links. Insert text on top of the image. These are elements #2 and #3 in my list of three critical components. (#2) Include the custom short link, which a viewer can type into their address bar since it’s short and easy to understand. Of course, also include a hyperlink in the image caption or tweet. (#3) Include a promise of what’s to come in the full article, or hint at what the full content contains. If it’s a “Top 3 Reasons Why…” post, you may want include the three reasons right there in the image with an invitation to get all the info in the full post. 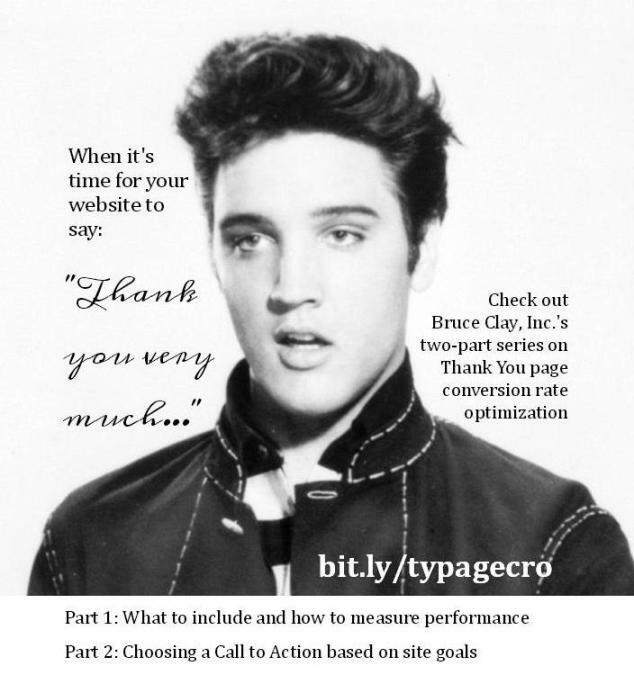 In the Elvis example I included a brief description of what was covered in each of the two-parts of the Thank You page CRO series. Try to make this message seductive, whatever that means for you and your content. 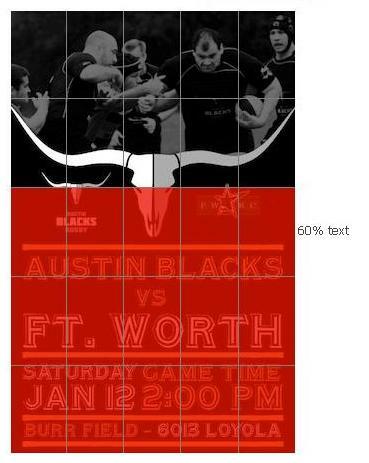 When the graphic is done, go to File > Download as > JPEG and save it. I’ve taken one graphic design class, one web design class and a handful of painting and photography classes, so while I’m not a professional designer, I’ve been exposed to the rules of good composition. I think these are the basics to keep in mind when you’re creating mash-ups. Make sure text is clearly legible. Black on white is best. White on black is hard for the eye to process. If text is anything besides dark text on light, not-busy background, make sure text is legible in other ways, such as increasing font thickness or putting a background color behind the text. Use no more than two font types. At least one should be extremely easy to read; sans serif fonts are generally easier to read online than serif fonts. 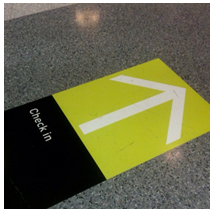 The other font can be stylized, used as an accent and in small amounts. White space is a component of good design, especially in the modern aesthetic. While the graphic will likely be dense as you’re trying to communicate a lot in a little space, available white space should be a consideration in choosing the image. If you want to get a background in some basics of design, I recommend Bootstrapping Design, a $ 39 ebook. It’s written for programmers, but I like it because it’s accessible design fundamentals for a non-artist set. Considering we’re in an age where everyone can publish online content, learning the basics of good design is an investment that will payoff. Shortly after Facebook’s update in March, it made a new rule limiting text in images used in ads, sponsored stories and Page cover photos to 20%. If you plan to “promote” the Facebook post including an image, pay to boost its visibility or turn it into an ad, the surface area of the image that includes text has to stay under 20%. Text placement fail. The sides of landscape images are cropped in the viewable portion on a Facebook wall. Clicking on the image displays it in full for the viewer. I’ll also note here that image posts as they’re displayed on a Facebook Wall favor portrait orientation and will cut off the left and right sides of landscape oriented images. 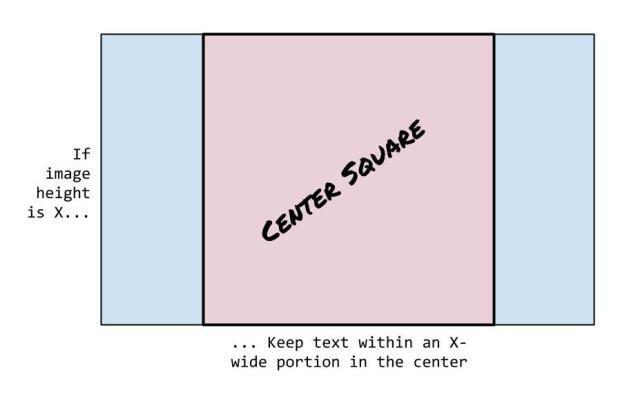 If you’re using a landscape image, try to keep the text within the area that is “center square” to the height of the image. I’ve illustrated the center square in this drawing. Yep, made that in Google Drive, too. Promote Your Brick and Mortar with Facebook Nearby was originally published on BruceClay.com, home of expert search engine optimization tips. 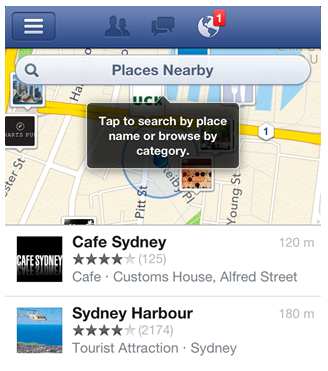 On December 12th, Facebook introduced the “Nearby” feature for its iOS and Android apps. Facebook Nearby allows users to find a place near them based on the recommendations of their Facebook friends. Functionality that allows users to contact a specific business directly. Only those businesses (large or small) that have a Facebook Page will be listed. With the Nearby feature, Facebook aims to become a personalised local recommendation engine. By tapping into the social connections and the increasing number of businesses building their own Pages, Facebook is entering the “local” market of other well-established location-based review services such as Foursquare and Yelp. Both have much lower numbers of active users (Foursquare counts approximately 30 million users, Yelp 78 million, Facebook, by contrast, has 250 million users tagging locations every month). Anyone who has updated their Facebook app since Monday will find the new addition in the menu. In the Nearby tab, users will see a search bar, a history list, and location categories – restaurants, nightlife, arts, hotels, shopping, etc. Each category also has its own subcategories (e.g. Italian food inside restaurants). Facebook is not simply listing locations arbitrarily, or based on their global popularity. With Nearby, Facebook is using true social recommendations to find the best places for each user based on friends’ interactions. Let’s say your Facebook friend Tim just gave an Italian restaurant located near you a great rating when he checked-in last night. It’s likely that Facebook’s Nearby algorithm would show you that specific location above the others. In order to prevent spam and fraud, only people who’ve checked-in to a business can rate it. Once a user chooses a location, he will be presented with Facebook’s redesigned location pages, which includes info like friends who’ve been there, hours, a map, star ratings and reviews. Users will also have the ability to connect to businesses directly within the Nearby tab on their smartphone by performing actions such as liking, checking in, calling or getting directions. After you’ve experienced the location, Facebook wants you to share that experience with your friends through rating and reviewing. In theory, the more people that participate in this way, the more accurate the recommendations will bec. Facebook says that 150 million people visit Pages on a daily basis – which means they have a huge amount of like, check-in, and rating data to pull from, making Facebook Nearby incredibly useful and a strong threat to similar applications. The company also said that this is an early release and that they will be improving the service as it gets more feedback. It also says that it plans to add place info from third party services to it in the near future. Facebook Nearby represents a big opportunity for businesses with a physical location to promote themselves, get found by and connect with new, local customers. Update their Page to include all the basic information, including address, store hours, phone number and details about the business in the About section. Update their category to make sure they appear when people are looking for a specific type of business. Encourage consumers to check in, like, rate and recommend the place to their contacts.